Sarasota, like many places in the state, was originally the home of native Americans who began settling in the area about 10,000 years ago. The first Europeans to discover the area were the Spanish, who landed at Charlotte Harbor to the south in 1513. 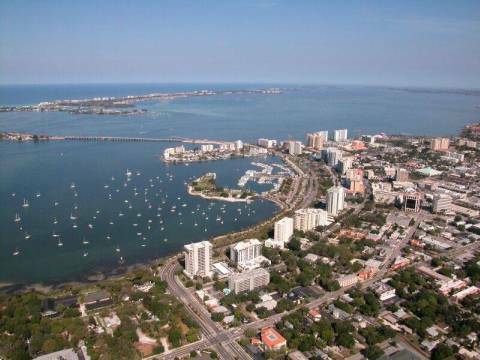 Sarasota Bay is large and sheltered from the Gulf of Mexico by barrier islands. The bay became a seasonal place for fishing and trading by Americans and Cubans in the years leading up to Florida becoming a United States territory in 1821. White settlers began moving into the area in big numbers by the 1840's. The area was known by then as Zara Zote on old Spanish maps, and the newcomers began calling the area Sara Sota. William Whitaker was reportedly the first permanent resident of what became in later years the City of Sarasota Florida. He sold fish and raised cattle, and married Mary Jane Wyatt of Manatee and they had 11 children. This family survived many hardships of pioneer life, including raids by the Seminole Indians. Many descendants of this family still live in Sarasota. 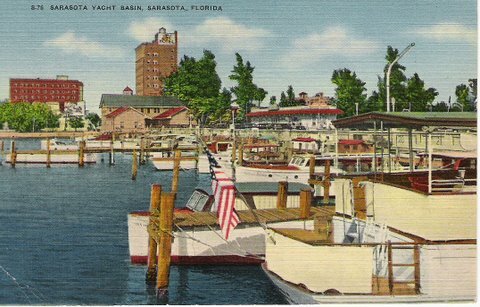 Sarasota was incorporated in the early 1900's. One of the earliest developers was Owen Burns, who built many buildings, houses, roads and bridges. John Ringling of circus fame was one of his earliest investors, but Burns went broke anyway in the depression that ended the big Florida land boom of the 1920's. Ringling went broke not long after. A contemporary of Burns that had a huge impact on Sarasota was Mrs. Potter Palmer. Born Bertha Honore', she married Chicago millionaire Potter Palmer when she was 21 and he was 44. Bertha liked to spend money, but she also proved to be an excellent businesswoman. When her husband died in 1902, she took over his business interests. She loved the mild winter climate of Sarasota, and bought more than 80,000 acres of land in the area in 1910. She bought another 19,000 acres in 1914 in the Temple Terrace area east of Tampa. Mrs. Palmer became a big time land developer, banker, cattle rancher, citrus farmer and Florida socialite. She encouraged many of her rich friends to spend their winters in Sarasota. Some of the land she owned is still known today as Palmer Ranch, one of Florida's largest planned communities. Palmer Bank was one of the most important banks in Sarasota until it merged with Southeast Banks in 1976. Mrs. Palmer died in 1918. In the 16 years after her husband's death, she more than doubled the family fortune. Her sons continued to operate the family empire. They eventually transferred their huge cattle ranch, Meadowsweet Pastures, to the State of Florida. It became Myakka River State Park. During Mrs. Palmer's time in Sarasota, she drew worldwide recognition for the city as an exclusive vacation destination and location for winter homes for wealthy northerners. Among these were John and Mable Ringling, and John's brother Charles. John and Mable built their magnificent mansion, Ca d'Zan (House of John) in 1925, and today it is an art museum on the National Register of Historic Places. Charles's estate became the campus of New College. Both Ringlings were active in the development of Sarasota, and in the cultural affairs of the community. Like many Floridians, they lost most of their fortunes in the collapse of the 1920's land boom. When John Ringling died in 1936, he had less than $400 in his bank account. These pioneers had much to do with what Sarasota Florida has become today. The opera, theaters, ballet performances, museums, art museums and schools were all grown from the seeds planted by the early visionaries. The Florida West Coast Symphony, Ringling School of Art, Asolo Theatre Company were all or in part gifts of wealthy benefactors. When these cultural amenities are combined with the natural ones like Gulf sunsets, boating from many marinas including Marina Jack right downtown, tropical landscaping, shell collecting, bird watching, balmy winter weather and well designed golf courses, Sarasota is a great place to visit or live. Probably more than any other place in Florida, the blue green waters of the Gulf of Mexico against the backdrop of sparkling white beaches make you feel like you are in a tropical paradise.